EBL – Ebook Library Relaunched as ProQuest Ebook Central! The EBL Ebook Library platform has now been relaunched as ProQuest Ebook Central. The new platform has the same great scholarly ebook content but with a streamlined interface and improved functionality. 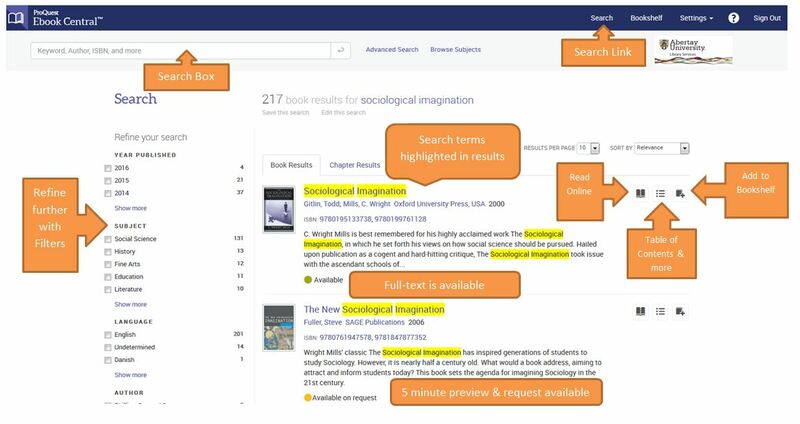 Where can I access ProQuest Ebook Central? Ebook Central is designed with mobile in mind. Access the site from your tablet or phone, and download ebooks for offline reading. What Can I do in Ebook Central? Where can I find more about Ebook Central? Simple to use filters allow you to easily refine your search by Year Published, Subject, Author etc. If you need any further help or information on using Ebook Central, just let us know! The issues with EBL eBooks and Internet Explorer generating error messages both on and off-campus have now been resolved. If you have any further problems accessing eBooks (or with any other resources) please let us know. You can contact us via Twitter, Facebook, Email, or by phone on (01382) 308833. Thanks for your patience with this and apologies for any inconvenience it may have caused. 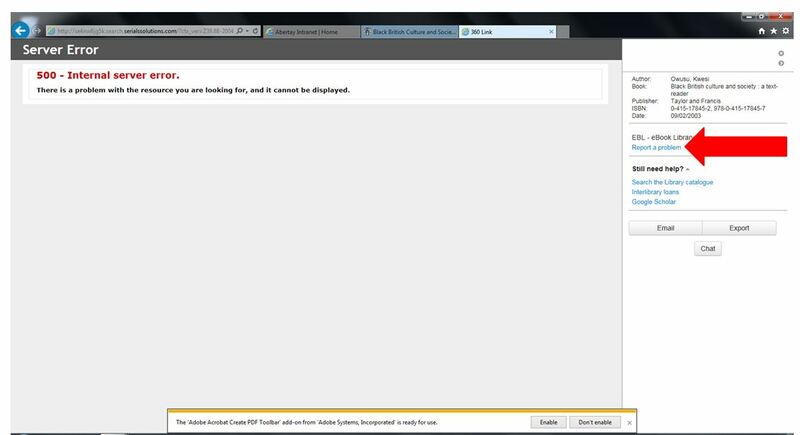 There are currently issues accessing EBL eBooks when linking out from Summon using Internet Explorer both on and off-campus. This issue is browser-specific so switching to Google Chrome (available on all university PCs) or Firefox will rectify the problem. You won’t get an error if you have already authenticated during the current session. If you are accessing EBL eBooks via the Library Catalogue or directly from the EBL platform, you will not encounter these error messages. Use of your browser’s back button may cause specific errors that can be resolved by going back to your desired resource and trying to login again. If you think you were sent here in error, please contact technical support. If you encounter this problem, please use a different browser. There is also a ‘Report a Problem’ option on the right- hand side of the 360 Link screen (where the red arrow is above) – please use this to send details to the Library for further investigation. This issue has been reported to the vendor and is being worked on as a priority. Apologies for any inconvenience this may cause.